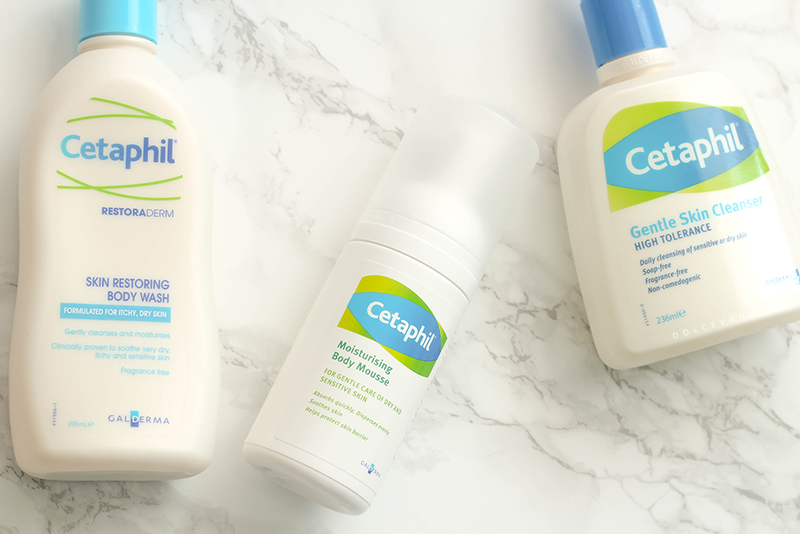 Cetaphil Moisturising Body Mousse & more. Cetaphil Restoraderm Skin Restoring Body Wash is one of the best washes I've used, it's like a shower cream, I put it directly onto my skin and work the lather up and simply wash off. Over the past year I've notice my skin (on my body / not face) can get irritated especially with Sodium Lauryl Sulfate contained products. This is SLS free so it's ideal for skin that is sensitive, dry and eczema-prone skin but also for any skin type. My skin is left smooth, moisturised & prepped for the next step. The Cetaphil Moisturising Body Mousse was pretty easy to use, it's a pump bottle and a few pumps of foam was ideal for one leg and my arms would only need a pump each. I found that there was no residue left over it absorbed so quickly. Whenever I think of a traditional mousse I think sticky although this wasn't the case. The skin felt moisturised, not greasy. I think it's a good product for skin that gets irritated easily as it's mild on the skin although it could be used for all skin types. I feel if you have extra dry areas on your body, such as the elbows and knees, you might want something more. The fact that it contains Glycerin (an ingredient I use in my hair) it gives reassurance that you've got something that is drawing and locking in moisture. There's also an ingredient called Dexpanthenol which is an emollient that helps irritated skin. Cetaphil Gentle Skin Cleanser, this I've been using for a little while. I noticed that it's popular for people with sensitive & acne prone skin, as it's meant to be less irritating. Looking at the ingredients Aqua/water, cetyl alcohol, propylene glycol, butylparaben, methylparaben, propylparaben, sodium lauryl sulfate, stearyl alcohol. I noticed a great few amount of parabens & also sodium lauryl sulfate is in the ingredients, although quite far down in the list, next to last, but SLS can be an irritating ingredient to sensitive skin. Thankfully it's not been that to my face. It's gentle and helps remove dirt or left over make-up while cleaning my skin, I keep it handy but I don't use it to start to remove my make-up it's not effective in that manner. You can purchase Cetaphil from Amazon UK, Boots and most pharmacies.